Once upon a time, on a fateful day in August, the world witnessed 45 minutes without Facebook. But during that time, something interesting happened. Without Facebook as a discovery source for news — something for which 68% of Americans use the platform — where did users go to seek information? Content intelligence company Chartbeat decided to dig into that question — and here’s what it found. 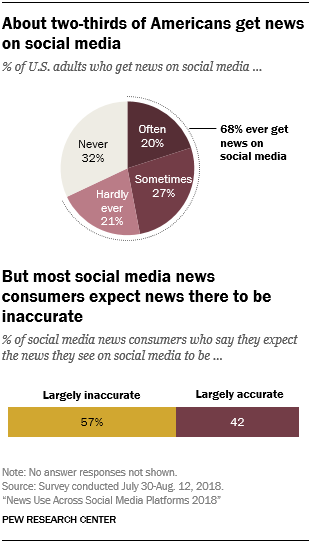 As previously mentioned, over two-thirds of Americans get their news on social media at least once in a while. Which begs the question: Without Facebook, where do people find information, especially news content? According to Chartbeat’s findings, users went directly to the source (of information). When Facebook wasn’t available as an information aggregate, direct traffic to publisher websites went up by 11% — and use of their mobile apps skyrocketed by 22%. Search referral traffic to publishers was also slightly elevated, by about 8%. What’s interesting is that this spike in traffic was not exactly an isolated incident. Rather, what happened during the “Facebook blackout” actually reflected an overall upward trend in referral traffic from non-Facebook sources — news aggregator apps that are built into mobile operating systems (e.g., Apple news), publishers’ own apps (e.g., the New York Times mobile app), and other content aggregators like Flipboard. All the while, referral traffic from Facebook has been on a somewhat steady decline. This tidal shift in sources of traffic to publishers could reflect an overall downturn in engagement with brands on Facebook. Since overhauling its News Feed algorithm in January to prioritize content from users’ friends and family (over that from brands), business Page engagement has reportedly dropped by as much as 50%. 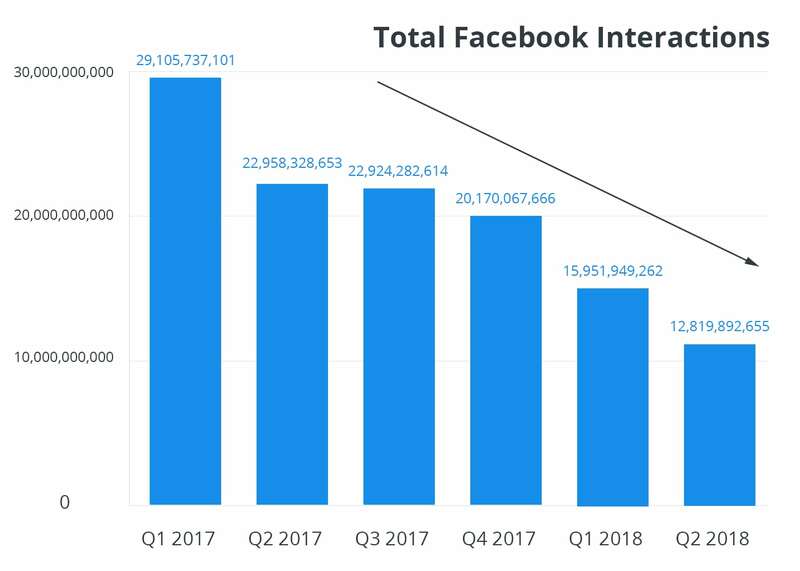 Even before the algorithm change, referral traffic from Facebook to many content publishers was already reportedly declining — by about 17% in 2017. But if that sounds like bad news for content creators, don’t panic: It’s actually a plus. Here’s why. Consider the fact that Chartbeat says that this behavior was almost “instantaneous,” and that it was only a matter of seconds before users pivoted to other distribution sources for news and other content. We’ve previously discussed the hesitancy among Facebook users to stray from the network, and the reasons they might not leave despite the company’s many issues — for example, an easy way to stay connected to a broad range of friends and family. 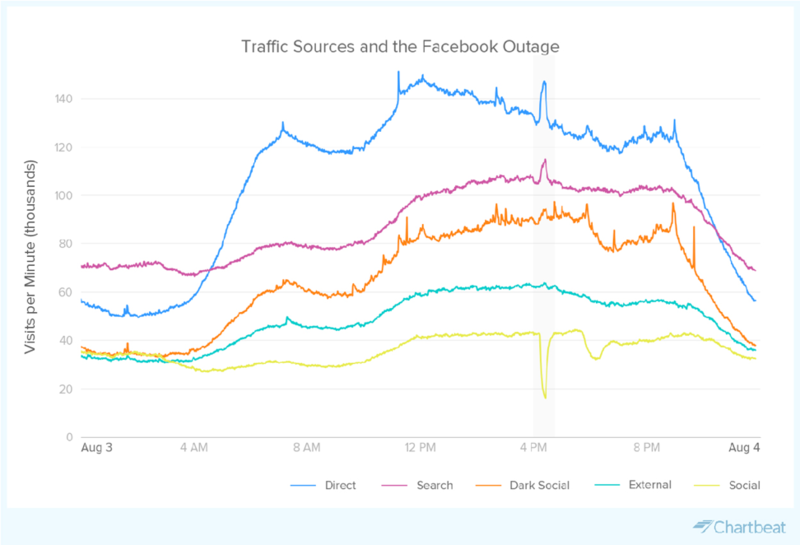 What this immediate reaction to the Facebook blackout — the near-instantaneous fleeing of users directly to publishers or aggregates — could indicate is that while there might remain a demand for Facebook itself, there also remains a demand for real-time information. So while we wouldn’t exactly advise abandoning Facebook altogether, given this user loyalty to the network, it might be worthwhile for marketers to begin brainstorming other ways to raise brand awareness on Facebook — for example, through compelling, easy-to-consume visual content. Which raises the question of how publishers can best drive traffic to their content. That’s why an important next step for content marketers to take is exploring content distribution channels — and partnerships — that aren’t quite as traditional for B2B publishers. 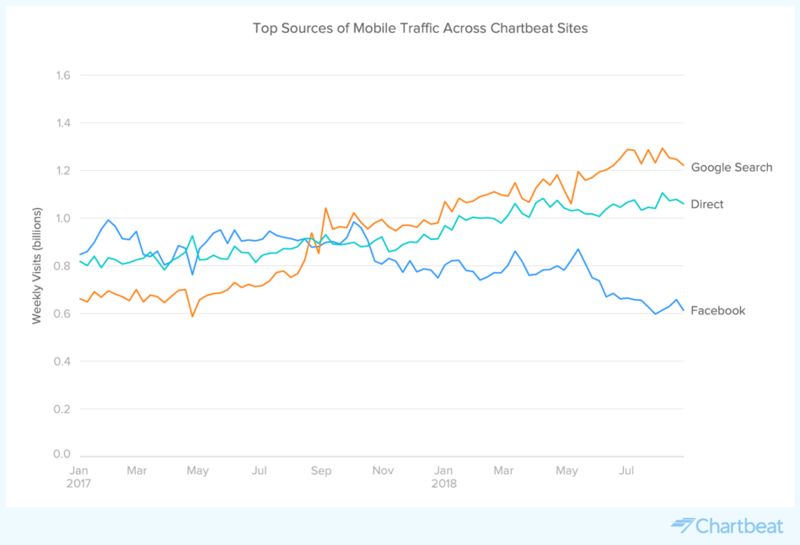 But in addition to those sources of referral traffic, it’s important to remember that during the Facebook blackout, a fair amount of users also turned to publishers’ own standalone mobile apps to discover information. In other words: No content distribution strategy is static. As platform algorithms, discovery channels, and user preferences continue to evolve, so should the way publishers and marketers raise awareness of their brands and content.